Seems that small is good, in even more ways than I realised. Take a look at these Tiny House Libraries – this free sharing initiative also helps communities promote the fun of reading! Read more about it at http://www.littlefreelibrary.org . Some of these are just so cute! landscape. In fact, in the past few years cloud computing has gone from an abstract idea to state-of-the art storage that we cannot do without. Within this shifting environment we find libraries in a wide range of organisations (academic, public, corporate, special, schools) re-visiting, re-imagining and re-branding their spaces, functions and service design. In the full panalopy of library services, one aspect that occupied a busy group of people last Monday was social media in all its many dimensions. Don’t just think of Twitter, Facebook or Google+. 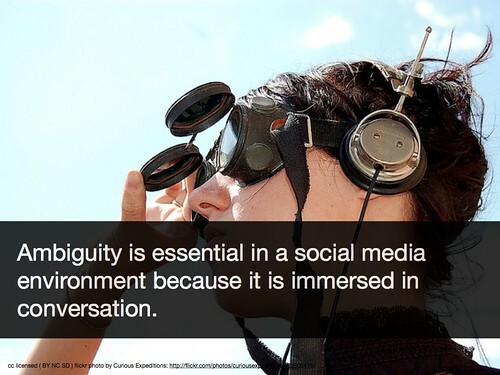 Engaging in a conversation around social media opportunities is much more than than just choosing tools and developing a social media strategy. Success in social media needs a compelling purpose. Such a purpose addresses a widely recognized need or opportunity and is specific and meaningful enough to motivate people to participate. Every notable social media success has a clearly defined purpose. 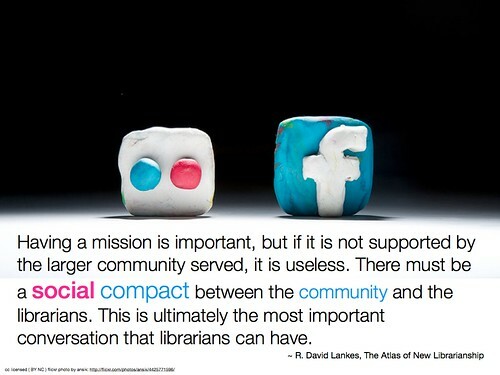 However, as librarians, we should have an interest that transcends that business approach. We are curators of knowledge and culture and embed products, tools, objects and strategies to add value to the trans-literate environments of our communities. At the day-long seminar Revolutionizing Libraries with Social Media, co-ordinated by ARK Group Australia, I explored these issues with the attendees, ranging from the obvious, to the ambiguities of workplace structures, digital preservation issues, content curation options, community, collaboration, personal social networking vs corporate social strategy, e-services, and more. My colleague Lisa Nash from the Learning Exchange, Catholic Education, Parramatta Diocese also explored eBooks and eServices. Always at the heart is our need to ensure that social media empowers connections within and beyond the library. We are ‘letting go’ – in order to allow our customers, patrons, or corporate clients to shape these services with Apps, eResources, recommendation services, or strategic information delivery systems. Not every library will benefit from the same social media tools. But every library can develop new options for marketing their services and change the way their clients or community interact with the library. In fact, there was so much to consider in one day, that the day was really just the start of more planning when the librarians got ‘back to base’. To facilitate this I put together a LibGuide as a digital handout. The advantage of this was that we could add requested items immediately as the day progressed , and can continue to curate this resource for future workshops as well as for those who so willingly engaged with us on Monday. 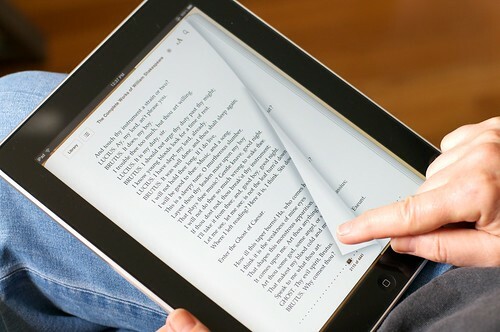 You can visit this guide at Revolutionizing Libraries with Social Media. It is a free event, taking place on Infolit iSchool (Sheffield University’s island in SL, which is focused on Information Literacy and Inquiry Based Learning). The focus of the mini-conference is exploring the nature of Inquiry Based Learning (IBL), and its use in teaching in both Real Life and SL. 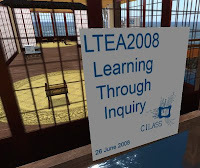 The mini-conference is aimed at anyone who wants to discuss the potential of IBL, learn more about it and/ or exchange experience: you may be using IBL already (whether in RL teaching or SL teaching) or just be thinking about using it. (optional extra para) Inquiry Based Learning is basically like problem based learning but more open ended – more like learning through research – and several unis in the UK have a focus on it, hence the RL conference.